Befriending After Divorce | Judith Ruskay Rabinor, Phd. By Dr. Judith Ruskay Rabinor, Ph.D.
Fifty-two year old Rona arrived distraught and tearful to a recent therapy group I run. Her 31-year-old son Joey was getting married. Although he and his father were distant since the divorce decades earlier, and his father had lived across the country for years, Joey had decided he wanted to include his father in the wedding. Rona had been looking forward to this big day, but now she was filled with dread, anticipating feeling awkward, sad and alone. Rona had been a devoted single parent. Now, she was conflicted. On the one hand, she knew her son’s desire to reunite with his father came from a deep longing. She wanted to honor his request. On the other hand, she hadn’t seen or spoken to her ex since Joey’s college graduation. Warren had left when Joey was young and only rarely and irregularly sent financial support. And now, he was remarried and Rona was not. Another suggested she email him. A third advised Rona to tell Joey that if Warren came, she’d feel uncomfortable. Fortunately, she rejected that last suggestion, knowing putting her son in the middle would be damaging not only to him, but to her relationship with him. Rona’s concern is one many boomers share: Is it too late to have a better divorce? Here are 10 strategies that can help you improve relations with your ex no matter how long you’ve been separated. Not all these tactics applied to Rona or will apply to you, so take what you can and leave the rest on the list. 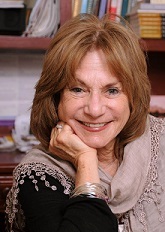 Dr. Judith Ruskay Rabinor, Ph.D.
1. Think about all the research. Children do best when parents get along. Your 30 year old is still your child. It doesn’t matter how old your children are. Even children in their 40s and beyond want to feel the love and support of their parents. 2. Write a note to yourself. Make a post-it: “Children do better when parents get along.” Place the post-it on your bathroom mirror, your refrigerator and the dashboard of your car. 3. Create a relationship vision. Think about the kind of relationship you want to create with your ex now. The key word is NOW. You may have gotten divorced years ago and your relationship may be ready for a revision. Our relationships are always changing, and yours may need to be altered, tweaked or adjusted. Be concrete. Use your imagination as your ally. 4. Honor the power of the pause. Before talking to your children about your ex, before talking to your ex, before talking about your divorce to anyone, take three deep breathes and pause. Stay away from bad mouthing your ex. Stay away from getting trapped in your own negativity. The past is over. Let it go. When you find yourself reviewing what went wrong in your marriage, or your divorce… picture a red light. You are in charge of your thoughts. And it’s never too late to start over. Change happens one small step at a time. Imagine inviting your ex out to coffee to talk about creating a better relationship. Imagine emailing your ex. Approach your ex in whatever way is easiest for you. Send an email inviting your ex to talk about your relationship. Include her in your Thanksgiving plans. Offer to bring him groceries if he is ill. It’s never too late to create new rituals. If you and your ex have a difficult relationship, be honest. What was your part in the problem? None of us are perfect. Your relationship with your ex was created by both of you. Forgive especially yourself when you do the wrong thing. 9. Take the high road. Be willing to make the first move. It will pay off because you will know you have done what’s needed. Dr. Judith Ruskay Rabinor, Ph.D. is a licensed psychologist who runs groups and workshops to help people develop a deeper connection to themselves and to others. 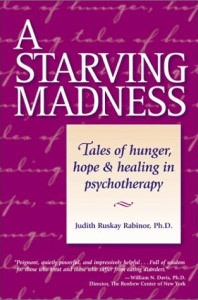 She’s the author of Befriending Your Ex After Divorce: Making Life Better for You, Your Kids and Yes, Your Ex (2013) and A Starving Madness: Tales of Hunger, Hope and Healing in Psychotherapy (2002). Contact her at Judithruskayrabinorphd.com. Divorced families are often described as disconnected, diminished and cut off, but last week I met an old friend, Brandy, who reminded me that this stereotype is often unfair and inaccurate. Brandy’s story offers the opposite lesson: that while divorce brings with it many losses, it can expand and enrich a family, sometimes in incredible ways. Twenty years ago, when Brandy married Joel, his active, energetic two year-old son Brian came to live with them. One morning, late to work and racing to get out of the house, Brandy burst into tears trying to get Brian’s sneakers tied to get him to daycare. Working full time and juggling their new domestic lives, she and Joel had quickly moved from the romantic stage of their relationship to “Did-ya-dump-the garbage-and-what-are-we-having -for dinner?” How had her life become so overwhelming? Just then the phone rang. It was Brandy’s mother, Sheila, who lived three flights up in the same apartment building. When Sheila heard Brandy’s plight, she flew downstairs, arrived at Brandy’s and made short work of Brian’s untied shoes. Sheila promptly fell in love with the adorable toddler. At this time, Brian lived with Brandy and Joel during the week, and spent weekends with his biological mother, Lynn. In those early and painful days of divorce, Lynn and Joel had stopped speaking. Feeling loyal to her new husband, Brandy avoided Lynn as well. Later Brandy would admit to feeling threatened by Joel’s ex wife, a beautiful and bohemian actress. True to stereotype, divorce had disconnected and diminished this family. Slowly, things changed. For a starter, Sheila, a working playwright, realized Brian needed all the adults in his life to get along—and she could play a crucial role. She offered herself as a “bridge” between Brian’s two families, creating her apartment for pick-ups and drop-offs. Routine, casual meetings with Brian’s mother allowed Sheila and Lynn to bond; soon Sheila learned that Lynn, who had lost her mother at an early age, now felt adrift about mothering. Sheila adored mentoring the young and floundering Lynn, professionally as well as in the mothering department. When Brandy learned of Lynn’s vulnerabilities and saw the bond that had arisen between her mother and Lynn, she began to feel less threatened by her husband’s beautiful ex wife. Feeling more secure, Brandy became curious, and one evening, when Lynn called to discuss the weekend schedule, Brandy found herself lingering on the phone. The two women began a lengthy conversation about their shared interest–Brian. Therapists often talk about the domino effect in family systems— when one person in a family grows, new options emerge for healing the entire system. That’s what happened with Brandy and her family. Brandy soon realized that if she wanted to get along with her stepson she had to get along with his biological mother. Lynn, for her part, continued to thrive under Sheila’s nurturing. Sheila found the role of “bridge” suited her in ways she could never have imagined. Before long, Sheila, Brandy and Lynn often found themselves putting their heads together to resolve the everyday problems of managing an active two year old who was now living in two homes. The healing connections spread. Now that Brandy felt comfortable with Lynn, it was easier for her to encourage Joel to reconnect to Brian’s biological mother in positive ways. Once Joel and Lynn’s relationship thawed, a new and loving expanded family could heal the place in everyone’s hearts that had been torn open by the pain of divorce. Brian now had four people (Joel, Lynn, Brandy and Sheila) who cared deeply about him. And this had all sorts of practical implications. Most Mother’s Days and many holidays were spent in the company of his father, his biological mother, and his stepmother and her mother too. What astonished my friend, Brandy was how much she, too, benefited from this expansion. When Joel was in one of his difficult, workaholic phases, it was Lynn who helped Brandy understand him better. When Brandy had a breast biopsy, it was Lynn and Sheila who waited with her for the results. And in Sheila’s final years, when she was stricken by a series of debilitating illnesses, she was tended not only by her daughter, Brandy, but by Lynn as well. “She was a second mother to me,” Lynn said at Sheila’s memorial service, years later. 3) Risk failing and know that failing won’t kill you—and it might make you stronger! 4) If you fail, create a new vision and start over. Greg and Elana are divorced for three years. Greg wants to enroll his gifted thirteen year old son, Alfonso in a special program for musically talented children. His ex wife, Elana, objects: it’s too expensive. Greg and Elana can argue for their separate positions, each accusing the other of being too extravagant or too cheap, too selfish or too unrealistic. Or, they can do what all the research on divorce advises parents to do: Communicate in the spirit of compromise and collaboration. But as most divorced parents will tell you, communication between exes after divorce is generally challenging. Not only are children overwhelmed by the turmoil of divorce, but one or both parents is apt to experience a host of complicated emotional responses, including sadness, guilt, anger and /or resentment. Learning to manage their emotional responses—in the midst of creating a new life—– is not easy. And creating a new co-parenting relationship with one’s ex is yet another challenge. And yet, creating a new relationship with one’s ex is exactly what Judy Rabinor, PhD author of Befriending Your Ex After Divorce: Making Life Better for You, Your Kids and Yes, Your Ex recommends.She guides divorcing couples through what she calls the “Befriending” process, helping them process their emotional responses while resolving the myriad of day to day issues divorced parents face. She calls upon divorced parents to create a new family structure honoring co-parenting as a lifelong responsibility and bond..
. He COMMUNICATES with the intention of being generous, calm and caring;. When Alfonso gives his first concert, they will truly CELEBRATE his accomplishment together. I was stunned. He argued that as a real estate developer in his own business, who worked at home with a flexible schedule, he was the more available parent than me, a psychologist who worked out of the home with fixed hours. But once I got over my initial panic I realized my soon-to-be ex was serious about co parenting our children. After a great deal of negotiation, we arrived at a compromise. Our children would live half the time with him and half the time with me. We were pioneering what has now become a more conventional arrangement for divorcing parents– joint physical custody. At the time I divorced, I could never have imagined we would develop a relationship that would become supportive and comforting, even friendly. When we first separated and were newly divorced, it wasn’t that way. We were distant, sometimes aloof, often angry and/or wary of one another. Yet for the most part, we were able to keep the phrase “in the best interest of the children” as our guiding North Star. Together, we celebrated their birthdays, attended school conferences and sat in the bleachers, cheering at swim meets and gymnastic competitions. We collaborated with each other to help the children resolve problems with school, homework, friends and our family life. Eventually, as time went on, we became more trusting and comfortable with each other. All this occurred over many years, not without many painful moments. All the research on the effects of divorce on children points to the same conclusion: Children do better when parents create a conflict free co-parenting environment. Your children didn’t ask for this divorce-and parenting and co-parenting are not optional. Co-parenting is a responsibility! A befriended co-parenting relationship means starting over and creating a new relationship that focuses on one thing: parenting. Imagine wiping the slate clean. Work on letting go of the past. Recognize that your ex will be your child’s parent forever, thus in your life forever. Recognize that your ex is your child’s parent and may offer your child more love and attention than anyone else in this entire world ever will. Not only is it important to be a good parent, but it’s important that you support your ex ‘s relationship with your children. 1) Keep your children out of your divorce. Make a commitment not to badmouth your ex—even if she badmouths you. Remove your children from your emotional and financial relationship with your ex. “This isn’t something I feel comfortable talking about with you,” or, “This is something mom and I are working on,” are perfect responses to questions that might trigger your own anger or bitterness. 2) Anger and bitterness not only damage your children, they damage you. Practice letting go of angry and bitter thoughts. 3) Forgive yourself when you are imperfect, when you can’t let go. 4) Even if your ex will not cooperate and continues to badmouth you, your responsibility remains: be the best parent you can during the time you spend with your children. And support your ex when you can, keeping in mind: children do better when they have two parents who love them. 5) Relationships are always changing. If you are co-parenting, you have opportunities every day to make new overtures. Change begins with one small step. Meet your ex at a parenting conference. Invite your ex to share a birthday celebration or join together for a family holiday. Let your ex know something positive your child said about her. 6) Take the high road. The only person you can change is yourself. Taking the high road means living as if the world is witnessing your behavior. Be on your best behavior and you will have no regrets. Are there times when befriending your ex is impossible? Uncalled for? You bet! If your ex is actively abusing alcohol, drugs or other substances, or, is physically or emotionally abusive to you or your children, befriending is not only impossible it’s unwarranted. Children should not be raised in an unsafe environment, and you may have to consult a lawyer, or a mental health professional. As a psychologist I help people face these issues every single day. Much to my chagrin, just six months ago my ex-husband, Arnold Rabinor was diagnosed with pancreatic cancer. 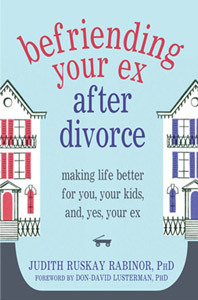 I was in the process of completing my book, Befriending Your Ex After Divorce: Making Life Better for You, Your Kids and Yes, Your Ex and Arnie and I had frequently joked about going on a book tour together with our current spouses! When he called to share the news of his diagnosis, he ended our conversation on a light note and said, “I guess we’ll have to put off the book tour for now.” Both of us knew that pancreatic cancer was deadly. Neither of us knew that within 10 weeks he would be gone. My book had not yet gone to print, so I had the opportunity to dedicate it to him. Here is an excerpt I would like to share with you…Click Here for full article. You are currently browsing the archives for the Befriending After Divorce category.